Today’s Chief Marketing Officer is tasked with many demands, made even more challenging with the ever-evolving digital domain. Their biggest challenge? Leveraging personalization to demonstrate and drive clear ROI to the executive team. 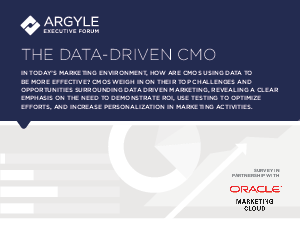 Download this report from Argyle Executive Forum to see how leading CMOs weigh in on other challenges, including how they can skillfully decipher, understand, and leverage the abundance of available data to engage with customers.